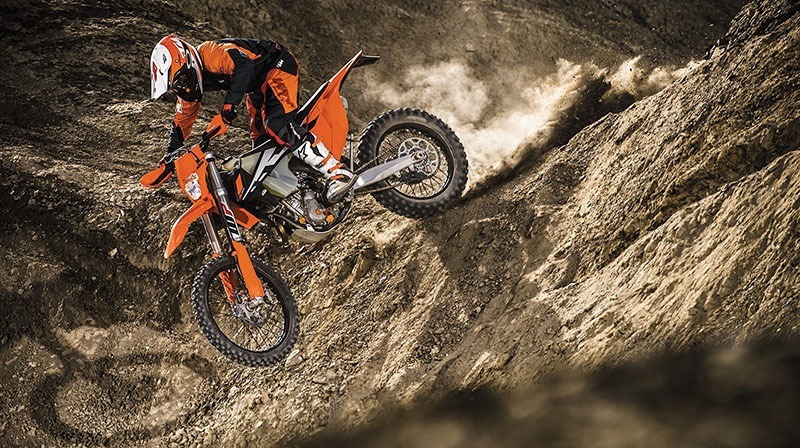 WEIGHT REDUCTION: The main target for the KTM engineers when developing the EXC-F models was a massive weight reduction compared to the previous generation. 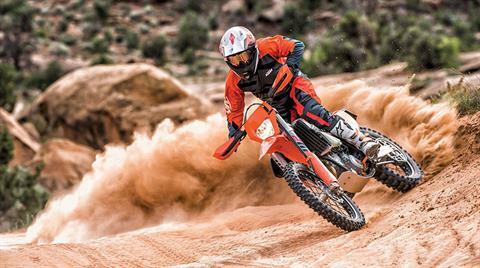 The result: the current EXC-F’s are the slimmest, lightest bikes in the dual sport segment. FRAME: The high-tech, lightweight chrome-moly steel frame is engineered for excellent handling, precise cornering and supreme stability. 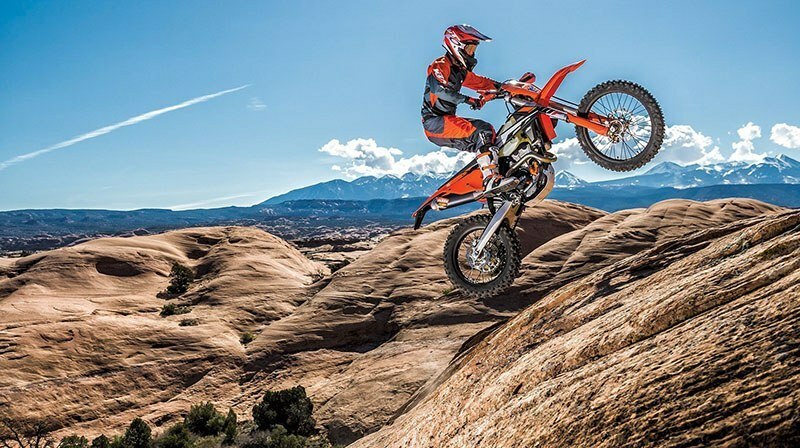 You can also count on high torsional rigidity and low longitudinal stiffness for better absorption of the energy created by the front and rear suspension sucking up jumps and bumps. In short: more comfort and less rider fatigue. Laterally attached, lightweight engine head stays contribute to a reduced vibration level. Two threaded inserts in the lower cradle tubes allow for an optional skid plate. The engineers were able to pull off all that, while making the frame two pounds lighter than that of the lightest competitor on the market. In addition, the frame is easier to maintain, easier to work on and supplies more space for the tank and other components. The bike also features an extra-light aluminum subframe, which weighs in at less than 2 pounds. FOOTPEGS: Sophisticated “No Dirt” footpegs prevent jamming up of the pegs, even when digging in deep ruts. The pegs on the EXC models are 6mm higher than the ones used on SX models, which benefits ground clearance. But you can swap them at will. SWINGARM: This updated design allows for an optimized mounting position of the PDS shock, providing more progressive action. Furthermore, the cast aluminum design guarantees lower weight and a perfect flex behavior. The single-component casting process also eliminates any inconsistencies and weak points. REAR SUSPENSION: The WP XPlor PDS is a newly developed rear shock. 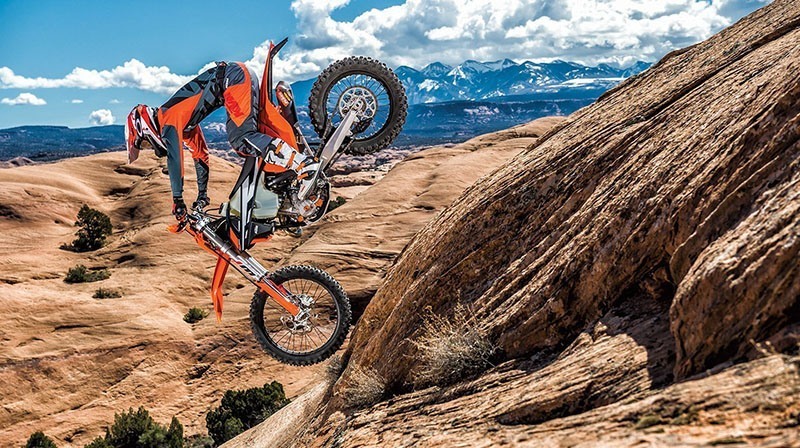 The PDS, the KTM proven and successful progressive damping system is kind of a KTM trademark where the shock absorber is directly connected to the upper side of the swingarm. This set-up has now been reworked with the new frame and swingarm architecture in mind. It boasts the best possible mounting geometry, provides even more progressive damping and features an all-new body with a smaller piston and a larger reservoir. The piston diameter was reduced from 50 to 46mm for reduced weight, the total length is reduced by 2.5mm and the shock stroke has been reduced by 4mm. In addition, it is now mounted 5mm closer to the centerline, which means nearly symmetrical loads for the swingarm and frame and more space for the exhaust. A second piston works together with a closed cup (instead of a needle) towards the end of the stroke and is supported by a progressive shock spring for exceptional bottoming resistance. With this new design comes a weight savings of 1.4 pounds. Various machined and anodized components and a distinctive WP color trim make this a valuable, high-end product compared to the less refined shocks of the competition. HANDLEBARS: KTM engineers know how to handle handlebars. This tapered unit, made of high-strength aluminum by NEKEN, features a newly developed throttle assembly with a robust aluminum body and easy free-play adjustment. An ODI volcanized grip sits on the right, while on the left side of the bar a comfortable ODI lock-on grip requires no glue or wire to secure it.You can now retrofit two interchangeable throttle cams, for different response characteristics to suit your specific needs. TRIPLE CLAMPS: The new generation is fitted with forged triple clamps with an offset of 22mm, ensuring a solid grip of the fork and precise handling. The handlebar is adjustable forwards and backwards over 4 positions, so the EXC-F will fit you like your favorite gloves. 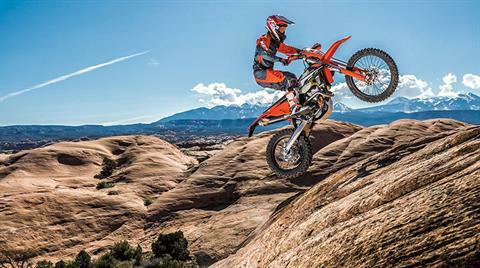 ENGINE: The new 250 EXC-F engine has been redesigned in order to make the new powerplant more compact and lighter, while delivering class-leading torque and power figures over the entire rev range. A new architecture with an optimized shaft configuration makes the engine 20mm shorter, contributing to the bike’s mass centralization and effortless rideability. Another major benefit of the new design is the weight reduction of 3.3 pounds; that’s including the comfort of the electric starter. The power curve has increased over the entire length of the 12,800 rpm rev range. 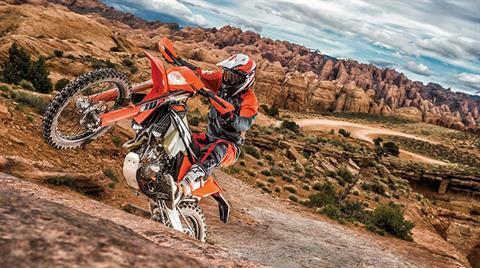 This makes the new 250 EXC-F brilliantly suited to both amateur riders as to pros at the peak of their ability. CYLINDER HEAD: The centerpiece of the compact DOHC engine is this cutting-edge cylinder head. It features lightened dual overhead camshafts with friction-optimized finger followers boasting a 30% harder DLC coating and a reworked timing drive. Four lightweight titanium valves and high-flow ports maximize the flow rate for an optimal power band and outstanding performance across the seemingly endless rev range of 12,800 rpm. Two new lateral stays allow an efficient fixation of the engine to the frame and reduce vibration. CRANKSHAFT: The 250 EXC-F’s crankshaft utilizes a 6mm shorter connecting rod, making for an overall compact and lightweight engine with a snappy power delivery. A plain big-end bearing with two force-fitted bearing shells runs directly on the crank pin. This design is a must for the extremely high engine speeds and the unrivaled power of this 250 cc engine while also enhancing the engine’s durability for long crankshaft service intervals. 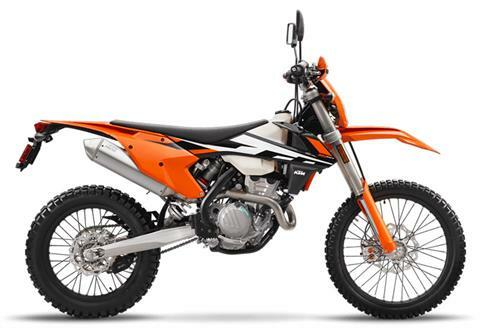 CLUTCH: The 250 EXC-F employs the KTM-developed DDS clutch (damped diaphragm steel) with a wear-free steel basket and extremely heat resistant clutch plates. This clever design employs a diaphragm spring instead of the usual coil springs, making for considerably easier clutch action. A diaphragm spring also leaves sufficient space for a damping system to be integrated into the clutch hub. The goal is traction, but durability is as well. A lighter basket, a reworked inner hub and a pressure plate providing better oil supply and unsurpassed cooling up the longevity of the DDS clutch. Light operation and telepathic amounts of control are standard with this hydraulic Brembo actuated clutch. CYLINDER AND PISTON: Inside the shortened cylinder, with a bore of 78mm, thumps a reliable box-type piston made by CP. Its crown geometry is adapted perfectly to the high-compression combustion chamber (12.8:1), where its rigid structure and low weight maximize performance. Thanks to low oscillating masses, the engine revs freely with plenty of power. BODYWORK: KTM R&D, Kiska Design and the factory racers had their say in shaping the plastics with one goal: complete harmony between rider and bike. Perfect ergonomics and contact points provide maximum comfort in movement on the EXC-F. The I-beam structures of the front and rear fenders guarantee maximum stability and a low weight thanks to well thought-out construction and mounting. They also stay cleaner for longer. Cleaver brake hose routing on the front number plate prevents wear and tear. BATTERY & WIRING HARNESS: This new engines is fitted with KTM’s proven electric starter – a unique KTM feature and a major benefit at all levels of racing. A super compact 495g lithium ion starter battery breathes life into the engine, shaving off two pounds of excess weight while offering three times the starting energy of a conventional battery. Because of its reliability, we decided to eliminate the kick-starter entirely. The battery and wiring harness are centralized in a compartment above the airbox, allowing the mechanic to remove the subframe without having to remove the electronics. A happy mechanic is a good mechanic.